As part of our treatment of fleet tactics, we should spend a few, brief moments with the most unlikely fleet engagement of all: combat in the gulf between the stars. The first question a fleet commander must ask herself is how combat in interstellar space could ever come about in the first place. It’s a question we’ll answer in a moment, but first let’s remind ourselves why ships and warboats clash within a star system. Planetary systems provide the cover of asteroid belts and planets, both of which can be used for tactical advantage. There are gravity wells too (especially those centered on planets), and raw material aplenty to throw into those gravity wells. 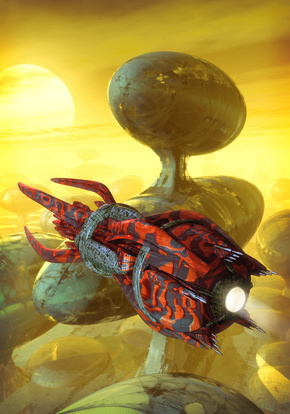 A system’s moons and planets provide natural defensive bastions to take or defend. Planets can provide resources too, in the form of food, raw materials, and people. Populations can be used as miners, soldiers, craftspeople, explorers, or blood sacrifices for your vengeful pantheon of gods. Planets are worth fighting for. Out in the space between the stars there are none of those things. No one owns interstellar space. No one would want to. Even for Marines, it is easy to forget how vast the gaps are between stars. Some people wax poetically about these distances, comparing star systems to specks of dust — or seeds perhaps — floating on the vast ocean of interstellar space. Yet even that description is inaccurate, for there is no two-dimensional ‘ocean’ surface bounded by a fixed shoreline. The stars carry out their whirling dance around the galactic core in absolute emptiness, trapped and jerked around their orbits by gravity. Sea faring vessels navigating a planet’s ocean can use a fixed littoral geography. Continents do not move on a human timescale. Ports do not normally shift position. By contrast, stars do. Our origin star of Sol, for example, is traveling around galactic core at a speed of 230 klicks per second. Relative local stellar geography remains broadly constant over the timescale of an interstellar journey, but on human and ship scales, it is shifting constantly. If you plot a course to a star ten light years away, for a ship with an average velocity of half lightspeed, you will need to aim for where that star will be in twenty years’ time. Ten light years is next door in interstellar terms, but over the course of your flight, your neighbors will have moved approximately 150 gigaklicks, or a thousand times the distance between Earth and Sol. And that, remember, is to pop over to see the neighbors. Most journeys are longer. As a consequence, star navigators do not have the equivalents of the fixed trade routes and deep water channels of sea farers. Earth histories talk of deep water blockades. Intercepting mid-Atlantic convoys traveling from North America to Europe was crucial in several major conflicts. To do something similar in space is nearly impossible. With good intelligence and luck, a fleet commander might anticipate roughly where an enemy convoy might be, but matching vectors to engage an enemy wishing to evade is almost impossible. Convoy killers patrolling the deep waters of a planetary ocean can push against the water to slew around and change course to intercept. By contrast, in the vacuum of space, while it’s true that convoy hunters could point their bows in any direction within a few short minutes, inertia would keep them moving in the same direction, no matter where their bows were pointing. To change the direction of movement and reach intercept velocity is an operation that would take weeks of constant acceleration. What all this amounts to is that interstellar fleet engagement is really a limited extension of in-system warfare. Battles occasionally take place on the hinterland of star systems, analogous to mining the bay leading to a sea port. For example one power may attempt to mine trade routes and another to counter with mine clearing. Once out by a few light weeks from the edge of a stellar system, there are only four possible circumstances in which ship-to-ship combat can take place. One: engine damage. The maneuver capability of one fleet’s ships has been severely damaged, meaning an enemy has the time to change course, pursue, and catch them. Two: by mutual consent of both parties. This is the most common reason for interstellar conflict, usually where two fleets — each confident of its own superiority — meet midway between two systems for a ritual showdown. Three: Mutiny. This may lead to conflict between loyalist and mutineers within the same fleet.